RAEME enjoys a reputation for service and technical competence, a reputation hard won and highly valued. It has resulted from several generations of professional officers, warrant officers, non-commissioned officers and craftsmen committing themselves to creating an edge for the combat arms and services they serve through the delivery of outstanding maintenance engineering and recovery support. Increasingly, soldiers of the future will depend on this ‘technological’ edge to enhance their equipment on the modern, complex and fluid battlefield. In turn, they will turn to RAEME personnel to provide leadership, technical management competencies and innovative maintenance methods to enhance the technical integrity of their equipment through increased reliability, availability and maintainability. Thus the ‘Corps’ future on the modern battlefield is assured. Most importantly, the ‘Corps’ reputation, as an active member of an integrated combat-team, contributing to the defence of our Nation, will only grow richer: its spirit is in the hands of the people who comprise our ‘Corps’ past, present and future members. More on the Corps can be found at this link. Joining the Association is easy and costs only $10 per year or $100 for life membership. Your contributions and input allows us to fulfil the goals of the association. Details on the benefits are located on the Membership page. One of the core goals of the association is to promote the identity of the Corps in Queensland. A key strategy is to organise events throughout the year. We encourage every member of the Association to attend. A list of events is located under Notices. These are held at the Kedron Wavell Services Club on the first Wednesday of the month commencing at 1730 hrs. The meetings are used to keep those with an interest in all things "RAEME" up-to-date. Every member or guest of the Association is encouraged to attend. 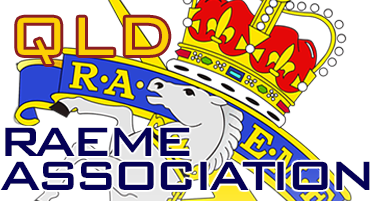 The Royal Australian Electrical and Mechanical Engineering Corps Association Queensland Inc ('RAEME Association QLD’ or ‘RAQ’), is established in accordance with the terms of the Constitution located on the Administration page. As a volunteer organisation we have a strategic plan to promote and reinforce the spirit, reputation, image and competencies of the Corps through its past, present and future members. If you have any feedback, please contact the relevant committee member on the Contact Us page.